Did you forget to get a Christmas gift for that niece or nephew who you see once a year? If you're lucky, the Walmart near you may have a Merge Cube in stock. When paired with the 57° North game for the Merge Cube, the mysterious-looking cube offers the possibility of extended sessions of virtual adventure in the palm of your hand. 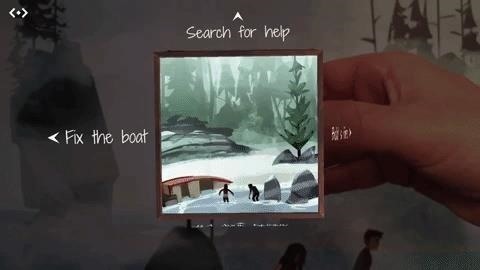 Available for $2.99 through the App Store or Google Play, 57° North is a choose-your-own-adventure game that takes place in augmented reality. Merge Cube acts as a six-sided marker which a smartphone scans to reveal AR content. In 57° North, the content takes the form of animated comic panels that tell the story of two children stranded in a strange land. The Merge Cube also acts as the user interface, with players turning the cube toward the decision they want to make. There doesn't seem to be much room for marker-based AR experiences now that ARKit is here and ARCore is coming around the corner. However, 57° North offers an intriguing argument in favor of Merge Cube, which, up until now, offered just a handful of mini-games. Developer Mighty Coconut claims that, depending on choices made in the story, a single run-through of the story can last up to an hour. Merge Cube is available through Amazon or Walmart. Also available are the Merge VR/AR Goggles, which make viewing the content on the Merge Cube easier; however, any Cardboard-compatible headset will do.